The last Friday of each month brings an especially Bohemian feel to galleries and museums around Wichita. It’s a night to stay open late for locals and visitors as they delve into downtown, the artistic heart of the city. As artists showcase their talents or debut new exhibits, crowds of people pour into shops for free. It’s here you can catch live music or interactive displays of artwork. If something catches your eye – buy it. A lot of the pieces on display are for sale. 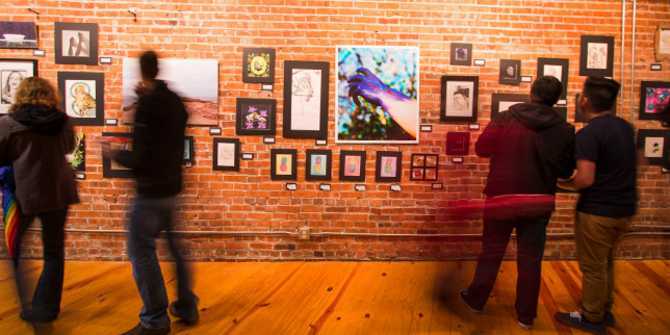 Use Final Friday as an avenue to explore this unique culture and see a side of Wichita you haven’t experienced before. Hours vary, but all participating establishments are open between 7-9 p.m. Paint the town on June 30 for access to an interesting showcase of different types of art at The Workroom, including textile artist Heather Byer’s “100 Faces.” The exhibit showcases the expressions and relationships we have as humans to the people in our communities. Head over to CityArts as local artists use their medium in hopes to launch a discussion to engage viewers. Wil Fathi’s “F’s Walk” will be in the main gallery June 30, alongside an album art exhibit in the balcony gallery, in partnership with Spektrum Muzik. It isn’t just art galleries and museums, restaurants and local businesses have special offers during the monthly event. Take the Q-Line Trolley for a ride through Old Town and stop at places like 86 Cold Press, Reverie Coffee Roasters or Aero Plains Brewing. There’s still a chance to get out and enjoy all the fun. Catch the remaining Final Fridays on May 26, June 30, July 28, Aug. 25, Sept. 29, Oct. 27 and Nov. 24.